GAMMA series thyristor-controlled reactor (TCR) converter modules dynamically adjust equivalent reactance of shunt reactors up to 30kVAr and support dynamic power factor control (PFC) applications where extremely fast reactive power compensation is necessary. Converter modules consist of three single-phase phase-controlled bidirectional thyristor units and can control each phase independently. Through phase control, the net RMS voltage across each shunt reactor can be varied continuously. This way, the net reactive power flow can be controlled and desired reactive power rating may be achieved instantaneously. GAMMA converter modules are internally protected against overheating. GAMMA modules can operate with both NPN and PNP open collector triggering circuits. 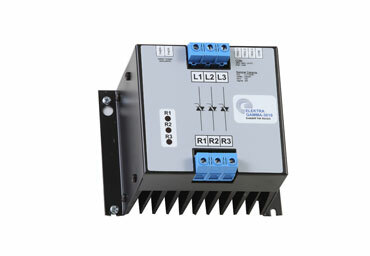 They can be controlled easily with PLCs and PFC relays. The modules monitor reactor voltages, line voltages and internal temperatures and provides LEDs on the front panel for diagnostics. They are also equippled with external thermostat connection terminals to protect the shunt reactors from overheating. GAMMA modules protect the shunt reactors from overheating, overvoltage and transients, hence enabling long-lasting dynamic power factor control.